Learn how to meal plan in 7 quick and easy steps–it’s not as hard as you think! Creating a weekly meal plan is an easy way to simplify your life by eliminating mealtime stress. Get my tips and tricks, as well as a printable meal plan template! Has 5pm ever rolled around and caught you by surprise? A small bit of panic creeps in and the age-old question follows: “What are we going to have for dinner?! ?” (insert crickets chirping). It’s then that you realize all of your meat is in the freezer (doh!) and you’re out of boxed macaroni and cheese. Your kids are crying and your stomach is grumbling, so you either order a pizza or throw everyone in the car to swing by a restaurant. Why is it that dinnertime still surprises us? We all know it’s coming, every day, yet we don’t always plan for it. Well that is about to change. 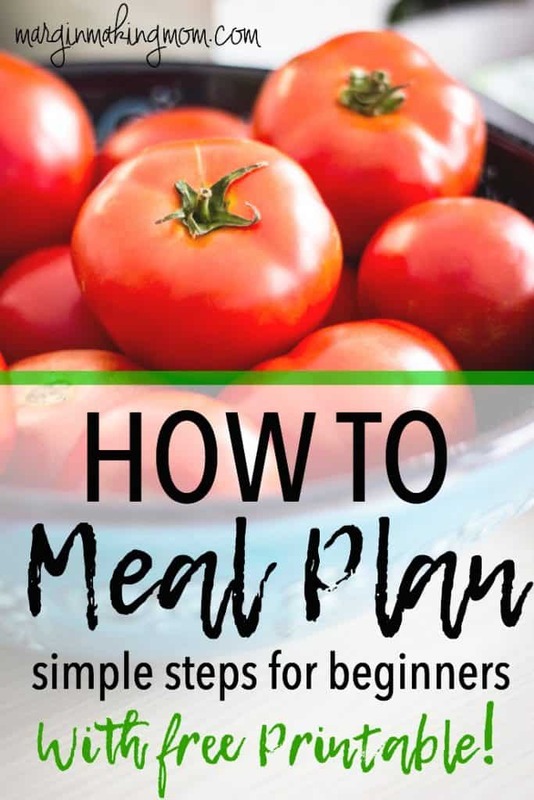 I’m going to share with you my own tried and true process for how to successfully meal plan in 7 quick and easy steps. Many people are scared by the idea of meal planning. It seems complicated, they don’t really know where to start, and they don’t have hours to spend devising a detailed plan. However, it doesn’t have to be that way! 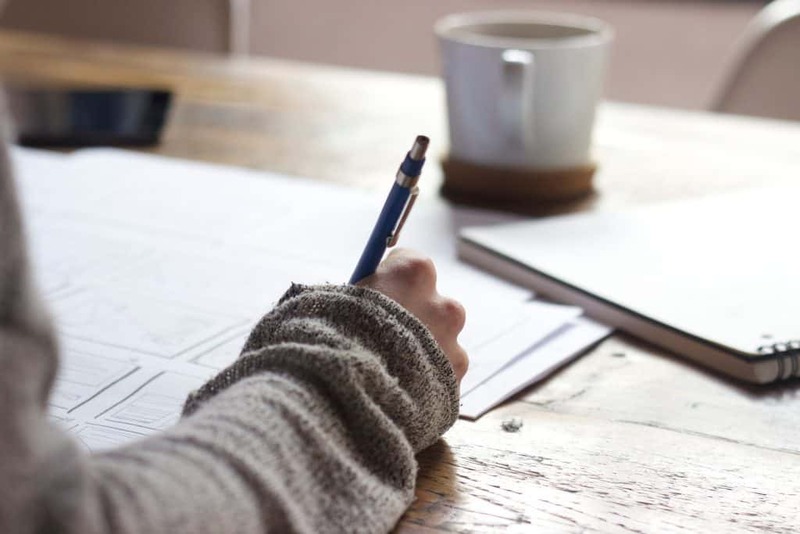 If you follow these 7 quick and easy steps to meal planning, you’ll be surprised at just how well this process can simplify your life. I heard it said once that you should know what you’re having for dinner by 10am every day. And I have to say, following this advice will eliminate the frustration and overwhelm that can hit you at 5pm. Not only that, but having a meal plan helps you to only purchase grocery items that you will need, rather than haphazardly throwing things into the cart without any real plan of action. This helps to provide some financial margin as you have more control over your grocery budget. Having a meal plan also provides margin in the form of time, since you don’t have to waste time trying to figure out what to have for dinner every day, running out to a restaurant or drive-thru, or making extra trips to the grocery store. As an added bonus, having meals at home as a family can promote bonding and togetherness for the family unit. Win-win! If you’re intimidated by meal planning, you’ll soon realize just how simple the process can be. 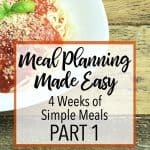 It involves only a few easy steps, and I’ve created a FREE Weekly Menu Plan printable just for you! These steps should only take a few minutes to complete, and you only need to do it once each week. Creating a weekly meal plan for your family doesn’t have to be some elaborate endeavor. These are the steps that I have used every week for years. The steps for creating a meal plan should only take a few minutes to complete, and you only need to do it once a week. Creating a weekly meal plan doesn’t have to be some elaborate endeavor! These are the simple steps I have used every week for years. Jot down a quick master list of meals that your family enjoys. Save this list and add to it as you think of or discover more options. These should be tried and true, easy to make favorites. Nothing fancy schmancy that you won’t feel like making. This list will serve as inspiration when you’re in a rut! You can always ask your family which meals are the ones they never get tired of having, or check out my suggestions below. How many dinners will you be having at home this week? Will you be getting home late any evenings (and therefore need a super quick meal)? Are there any nights when you will not be eating at home? Will you be having company over? Check your pantry, freezer, and refrigerator. Do you have any ingredients that could work for your master list of meals, or for other meal options you can think of? If you have the time, check the weekly ad for the store where you’ll be shopping. Is there anything on sale that you’d like to plan a meal around? If you don’t have time for this step, that’s okay–just skip it! Using the information from the above steps, plan what your family will be having for dinner each evening. Don’t forget leftovers! I’m a big fan of cooking once and eating twice, so you may want to incorporate that into your plan as well. 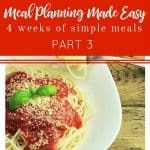 Write this plan on your printable meal plan template. Simplify breakfast, lunch, and snacks. At this point, your goal is to just plan your dinners. Keep breakfast and lunch simple. In my home, we typically have the same things for breakfast most mornings (cereal, oatmeal, toast, eggs), so I don’t make specific plans for different breakfasts. The same is true for lunch and snacks–just jot down some ideas of easy foods to have throughout the week. If you want, you can always get fancier in these categories later as you become more comfortable with meal planning. I don’t plan specific breakfasts or lunches for specific days. I just plan various options and choose from those on any given day. This works really well for me and simplifies the process a bit more. As you’re planning your meals and snacks, jot down anything you will need to pick up at the store. These items can later be added to your grocery list. At it’s simplest, a meal plan is just that–a plan for your meals. Whether that’s a plan to eat out two nights this week and cook the rest of the nights, or whether that plan includes frozen pizzas, it doesn’t really matter. What matters most is that you create a plan that works for you. Some types of meal planning work better for different people or different seasons of life. Find out which type of meal planning is best for you so that you’ll be creating a plan you’re more likely to stick with. 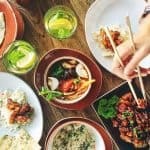 If you like the idea of having nightly dinner themes, check out these suggestions for how to create a themed meal plan. 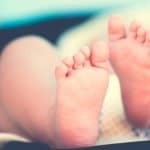 If you’re expecting a baby, create a freezer meal plan before baby arrives, so you’ll be able to focus less on cooking and more on snuggling! Now that you know how to meal plan, all you have to do is refer to the plan during the week. Maybe post it on your refrigerator, keep it in your planner, or whatever works for you. Every morning, look at what’s planned for dinner. Set out meat to thaw if needed, put items in the slow cooker if necessary, or determine what other prep work (if any) needs to be done. By knowing what’s for dinner by 10am, you’ll be set up for a successful evening mealtime. 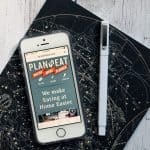 By taking just a few minutes each week to plan your meals, you will simplify your days, eliminate mealtime stress and scrambling, and reduce waste in your budget. To get your FREE Weekly Meal Plan printable, sign up below!